The PRISM Quartet’s recording, “Heritage/Evolutions, Volume 1” (innova), is under consideration for 2016 Grammy Award nominations in three categories. 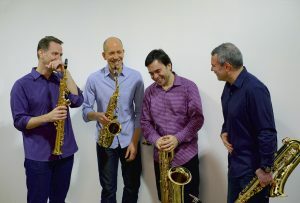 The album features new pieces and guest appearances by today’s most inventive jazz saxophonists: Steve Lehman, Dave Liebman, Rudresh Mahanthappa, Greg Osby, Tim Ries, and Miguel Zenón. “Heritage/Evolution, Volume 1” charts fresh musical territory, drawing on the saxophone’s cross-cultural heritage to blend jazz with everything from Western and South Indian classical music to Romani and Latin American folkloric music. NARAS friends, we respectfully invite you to check out “Heritage/Evolution, Vol. 1” as you consider the Grammy nomination entry list. Hear the full recording here. Acknowledgement: Major support for “Heritage/Evolution, Volume 1” has been provided by The Pew Center for Arts & Heritage. Additional support came from The National Endowment for the Arts, The Presser Foundation, and The Musical Fund Society of Philadelphia.